Single-hopped beers are a great way to really get to know your hops. They allow a brewer or beer enthusiast to identify key flavour characteristics of the different varieties that exist. There are more than 50 species of hops grown in Europe and North America, each with unique properties. For the American Cascade variety has distinct grassy characteristics that are not attributed to the spicy aromas of Saaz, used in Czech pilsners. Not all hop varieties are suitable for single-hopped beers, as they must have a high enough alpha acid content to effectively bitter and preserve the beer. Alpha acids are the compounds in hops that are responsible for beer’s bitter flavour, and also contribute to preservation. Bittering hops have alpha acid concentrations of 10% or higher, and are added to the kettle early in the brewing process. In contrast, aroma hops have only about 5% , and are added towards the end of the boil to contribute aromatic oils and volatile compounds to the brew. Aroma hops are often responsible for the fruity, floral, and citrus qualities of a flavourful India Pale Ale. Alley Kat also just released the fourth beer in their series of single-hopped DIPAs. 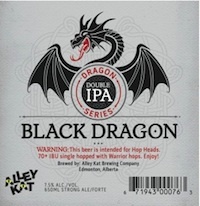 If I were to use one word to describe The “Black Dragon”, I would say “angry”. This DIPA is single-hopped with Warrior to 70 IBUs, a level of bitter that leaves little room for citrus hop aromas. The drying sensation will linger at the back of your tongue for several minutes. Two Danish homebrewers who made it big. 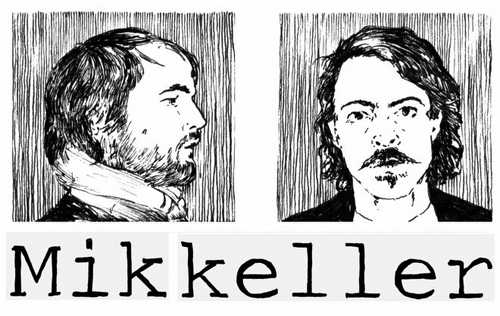 The Mikkeller Brewery out of Denmark has also released a series of 19 India Pale Ales, each brewed with a different single variety of hops. I selected the Simcoe variety, looking for a similar brew to remind me of my favorite Alley Kat DIPA so far, the “Red Dragon”. I was not disappointed. The citrus notes and fruity esters of the fresh Simcoe were complemented by a balance of Pilsner, Cara-crystal and Munich malts. I’m looking forward to sampling the rest of the Mikkeller series to educate myself differences between the hops. Citra, Amarillo, and Tomahawk are among the many I have written on my list of “Beers to Try”.